Earlier this month I found myself back at YouthNet Towers, this time as an expert for one of their expert chats. The Engagement and Support team at YouthNet oversee the running of a number of types of online chat. These include support chat (I also moderate support chats as a volunteer), general chat, film and book club chat, positive thinking chat and expert chat. You can read more about the different types here. Chats take place in a safe chat room space with a trained moderator present at all times. For expert chats, the team invite experts in to answer questions from the community. 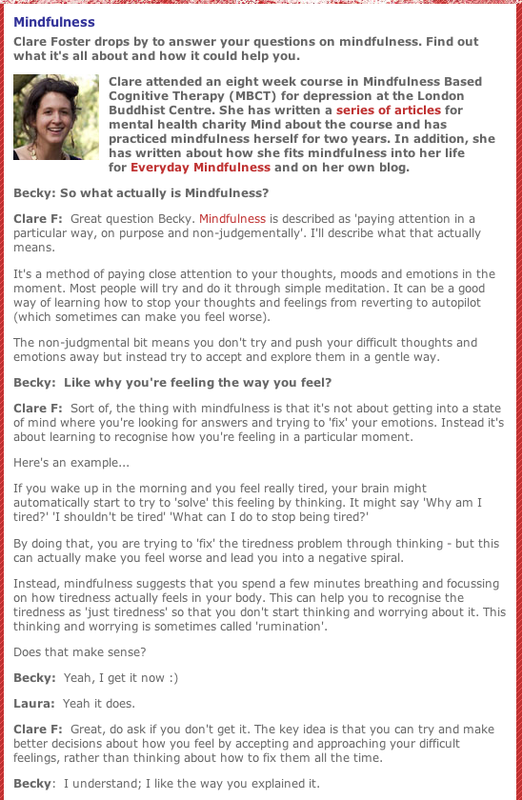 I answered questions on Mindfulness. There’s a taster of the transcript below but for the whole chat, have a look at the chat archives. It was an interesting experience working as an expert – especially as I have moderated many expert chats in the past. Mindfulness was a difficult topic to explain quickly in a chat environment but I hope that the young people who attended at least received a taster of what it involves as well as links to places where they can explore further. Community members have since posted threads about Mindfulness on TheSite discussion forum which I have answered in my role as volunteer moderator. 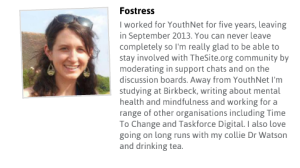 This entry was posted in Current & Recent Projects, Mental health & emotional wellbeing, Online support & communities, Young people and tagged MBCT, Mindfulness, Online, Realtime Chat, TheSite, Young People on October 29, 2013 by fostress.